The school will provide theoretical basis, working examples and hands-on computer exercises on FISHPATH, CEATTLE and Monte-Carlo methods (CMSY, AMSY) for application of ecosystem approach to fisheries management in data limited and data-rich situations. 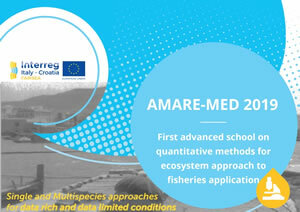 Outstanding lecturers of AMARE-MED 2019 are Dr. Natalie DOWLING from CSIRO (Australia), prof. André PUNT, Director School of Aquatic and Fishery Sciences (University of Washington, Seattle, USA) and Dr. Gianpaolo CORO, CNR-ISTI (Italy). Candidates must apply through the online form (http://echo.inogs.it/amare-med). Application deadline 15th April 2019. 30 applicants will be selected on the basis of experience, skills and demonstrated interest to the EAF. SUPPORT: few fellowships will be available for selected candidates from the Italy-Croatia CBC Programme area (http://www.italy-croatia.eu/cooperation-area) and from the Black Sea and from non EU Mediterranean countries. Flyer of the school (4.52 MB).